Design-build project to mechanically dredge approximately 40,000 CY of dioxin-impacted creek and canal sediments to reduce human expose risk, navigation, and improve waterway drainage. Transfer sediment to a staging area for processing and stabilization. 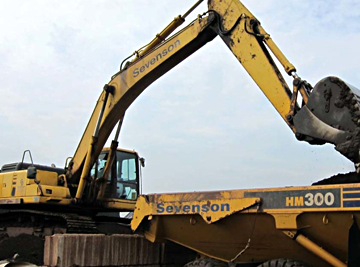 Loadout and off-site transportation/disposal of stabilized sediments to approved landfills. Coordinated dredging operations in active waterways impacted by significant tidal fluctuations and local marine wildlife. Project located in densely populated commercial and residential area within City of Miami. This required stringent controls to protect the public and manage heavy vehicle traffic safely. Incorporated constructability reviews results in modifications to the design which reduced owner costs by a total of $4.3 million. Achieved 52,398 safe workhours without a lost-time incident. 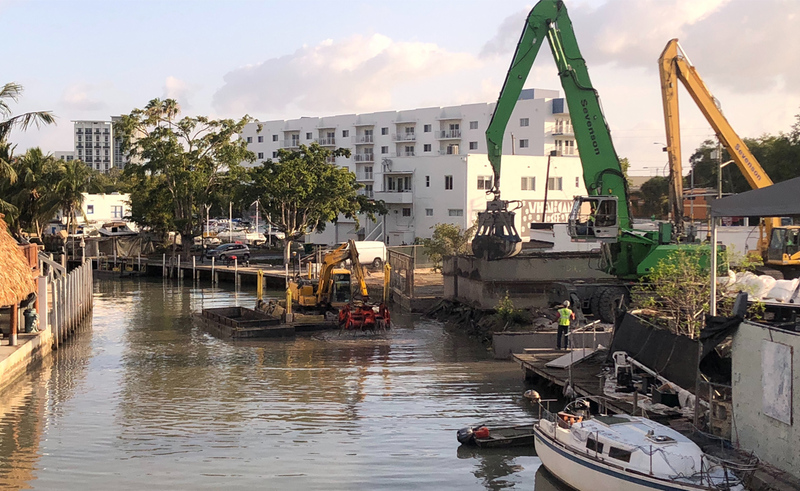 Located in Miami, Florida, the Wagner Creek/Seybold Canal Restoration Project required Sevenson to perform maintenance dredging to reduce human exposure risk, improve drainage and navigation. Wagner Creek is a narrow storm water conveyance canal. Seybold Canal is a navigable waterway and represents a major tributary to the Miami River and is lined with residential seawalls and docks. Both waterways are tidally influenced and serve as important refuges for manatees. 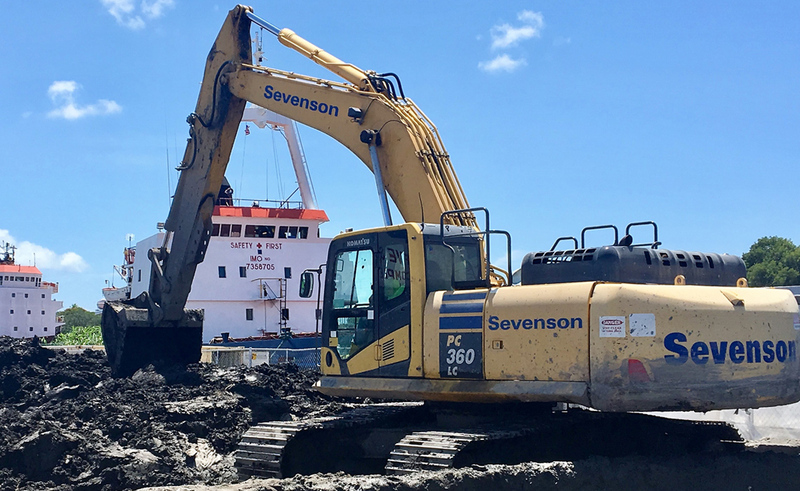 Sevenson was awarded the competitively bid contract to finalize remedial design documents with our team member AECOM and transition into the field to implement the scope of work requirements associated with this mechanical dredging project. Due to the close proximity of high-rise condominiums, hospitals, commercial buildings and residencies in this densely populated area of the city, the project was executed from multiple staging locations along both waterways. This required Sevenson to address logistical access issues related to deployment of equipment and personnel. Upon receipt of the notice to proceed Sevenson mobilized custom built company-owned equipment to the site. This included a light weight hybrid excavator with a 360-degree swing radius; custom-built dredge barges (18-ft x 35-ft) and (16-ft x 16-ft); Komatsu PC120 and PC240 excavators; material handling sediment scows; a level cut environmental clamshell bucket; and push boats. Identifying access areas for equipment set up and deployment proved an early challenge. Multiple staging points were mapped prior to the arrival of equipment to minimize disruption to individuals working in adjacent commercial buildings as well as residents who lived nearby. Multiple staging points were established through coordination with property owners to dredge along the face of their bulkhead. Equipment and personnel traversed residential property, commercial and industrial complexes, bridges, pipelines, and other obstacles to access the waterways. Aqua barriers were installed at high tide to maintain water depths required to continue dredging operations. 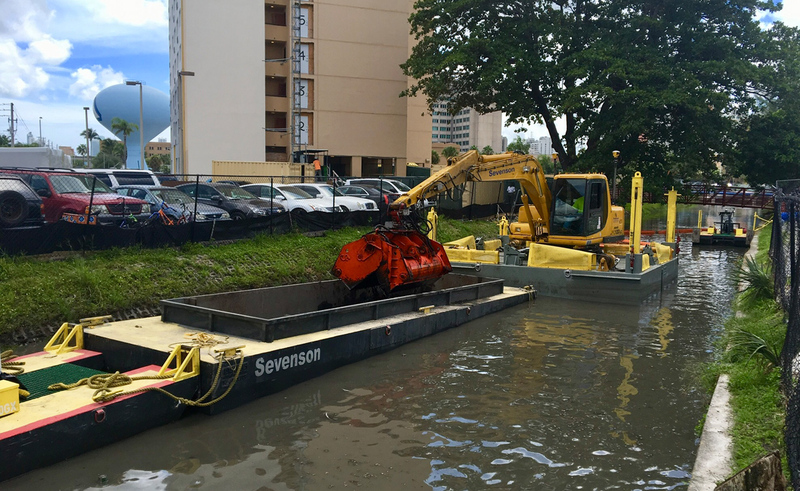 At Operation Section 6, Sevenson relocated 55 vessels from Seybold Canal so the area could be sheeted and seal off tidal exchange between the Seybold Canal and Miami River to meet turbidity monitoring requirements. The Seybold Canal and the Miami River are one of the many Outstanding Florida Waters. This designation means turbidity could not leave the work area. All vessels were stored at a new location/slip prior to sheeting the entrance into the Canal. Originally, Sevenson had planned to utilize 25 CY roll off boxes staged on small deck barges for sediment removal. However, due to the narrow width of the canal these roll off boxes would not fit in the canal efficiently. Therefore, Sevenson used custom built 25 CY scows. Dredging was performed to a variable depth, typically hard/original bottom, a PC120 with 1.5 CY clamshell bucket or a PC240 with a 3 CY bucket. Sediment was excavated directly into the custom built scows and delivered to the offloading area using push boats. A Sennebogen material handling unit transferred sediments to 25 CY water-tight containers staged on roll off trucks for delivery to the processing pad offsite and away from the public. When able, sediments were direct loaded into tandems for offsite disposal. 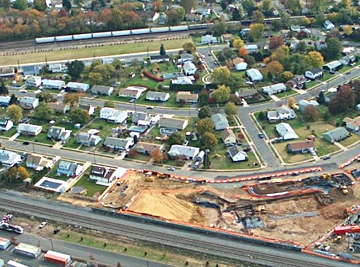 By choosing to amend sediment offsite, production was increased by 25%, ultimately saving around $4.3M in savings, and minimizing impact to the local residents with unnecessary traffic. Sevenson performed debris removal concurrent with dredging operations. Subsurface debris consisted of garbage and concrete rubble from existing foundations. Debris was resized, as required, for off-site disposal with the processed sediments. Sevenson worked in and around congested urban areas with high-volume traffic flows in close proximity to Jackson Memorial and the University of Miami Hospitals. At times, Sevenson modified workhours from day to evening operations to avoid disruption to commuters and the surrounding community. Permits and work plans were modified as well to satisfy US Fish and Wildlife and Florida Department of Environmental protection for night work. Concerns related to the endangerment of the manatees during dredging necessitated additional lighting to the work area. Manatee barriers were also installed. A designated lookout was setup and manned to watch out for returning manatees. Sevenson also implemented hydro barriers and manatee barriers (chain link fences) at each operational section to meet turbidity requirements, as well as to keep manatees out of the work area. Push boats delivered loaded scows to the off-loading operation where a Sennebogen material handling unit transferred sediment. Sediment was either directly loaded into 25 CY water-tight containers for transport to the staging pad for processing or stabilized in 100 CY steel boxes at the dock and loaded directly to trucks for landfill disposal. At the unloading area scows were positioned directly over a drip pan secured to concrete bin blocks on shore. The drip pan prevented spillage into the canal during offloading. Scows were dewatered using a 3-inch pump. Decant water was pumped to a 5,000-gallon storage tank for testing and disposal. After loading, sides of water-tight containers were draped with a tarp, secured, inspected, decontaminated, and transported to the off-site staging area and sediment processing area for stabilization. Dewatered sediment was then transferred to the staging area two miles from the work zone for processing. The unloading area was lined with a high-density polyethylene (HDPE) liner, crushed stone, geotextile fabric and paved to contain any drips from the excavator bucket during unloading. The site was surrounded by an 8-inch curb to contain any water released from the sediment. As done with the decant water all water on the unloading pad was collected and pumped to the holding tank for storage pickup and offsite treatment. All processed sediment designated for off-site disposal was loaded from stockpiles. Each driver was provided with appropriate manifests and facility-specific paperwork. Prior to departing the site, Sevenson notified the City of the name, location, and haul route of all transporters, providing copies of licenses, permits, and current regulatory status of the facility on a weekly basis. Sevenson encountered and resolved several challenges during execution of the work. 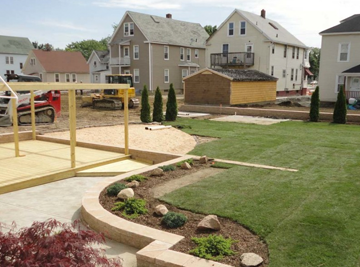 The challenges did not adversely impact the project schedule or budget. For example, in September, the powerful storm patterns of Hurricane Irma halted dredging activities for three weeks. Sevenson spent four days preparing for the storm, which involved securing equipment, tying down materials, and removing all sediment from the pad. Preparation ensured that no damage to equipment or construction materials occurred. This enabled site operations to resume smoothly following the storm. Another challenge included modifying the schedule and dredging operations around sporadic, but significant king tides. King tides are unique to the waterways of south Florida. They are naturally occurring and create especially high-water fluctuations. Sevenson maintained scheduled site operations around normal tides.